Through the magic of digital media, Don Lewis and Sue Wieber Nourse will transform Wareham’s Old Methodist Meeting House into the storm-tossed Atlantic coastline, so adventurers from five to 95 can experience first-hand the thrill of rescuing the world’s most endangered sea turtles. We’ll cast off the ordinary world of bricks and mortar, jump inside a dazzling sound and light show, and unleash our inner explorer. 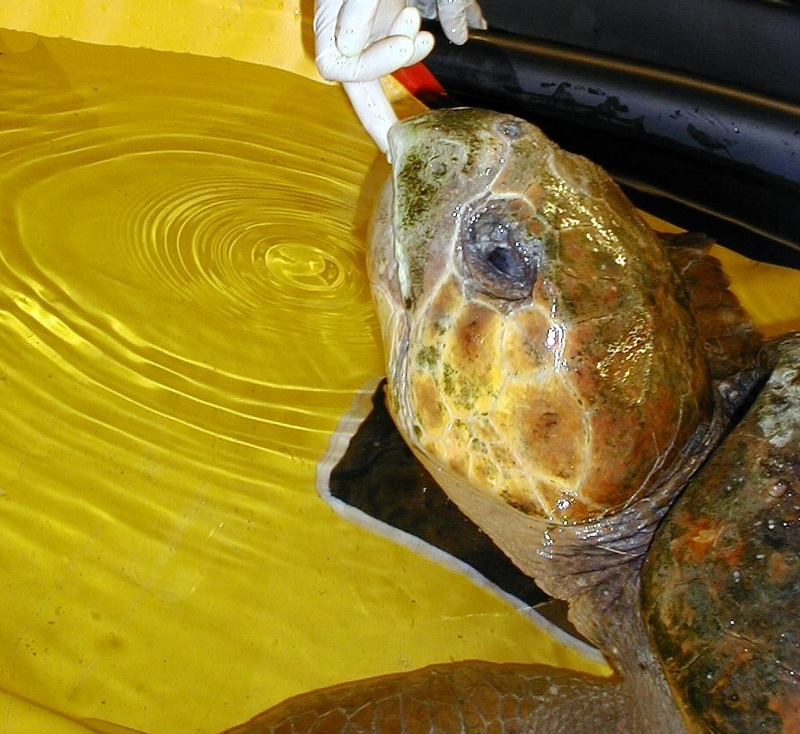 Along the ocean shore, we’ll come face to face with five species of sea turtles that frequent Massachusetts waters. We’ll rescue a half ton leviathan, a massive female leatherback, entangled in Cape Cod Bay. We’ll patrol windswept beaches on the coldest, darkest, most dangerous nights of November and December to rescue hundreds of the helpless tropical and semi-tropical sea turtles. The hook of Cape Cod, an accident of geology and the Laurentide glacier, has become a lethal trap for ocean critters. Here in the Great White North, sea turtle stranding season arrives each year as frost forms on the pumpkin. Juvenile sea turtles linger in Cape Cod Bay as fall arrives, sea temperatures drop and they’re cued to head south to warmer climes. Sadly, these turtles become locked in the bay by a wall of ocean water too cold for reptiles to pass. They’re trapped with no escape. 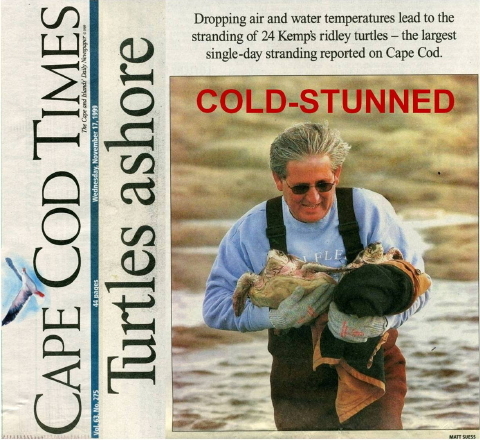 Eventually bay water, too, reaches critical temperature and these turtles become cold-stunned and strand on bayside beaches in fall storms. 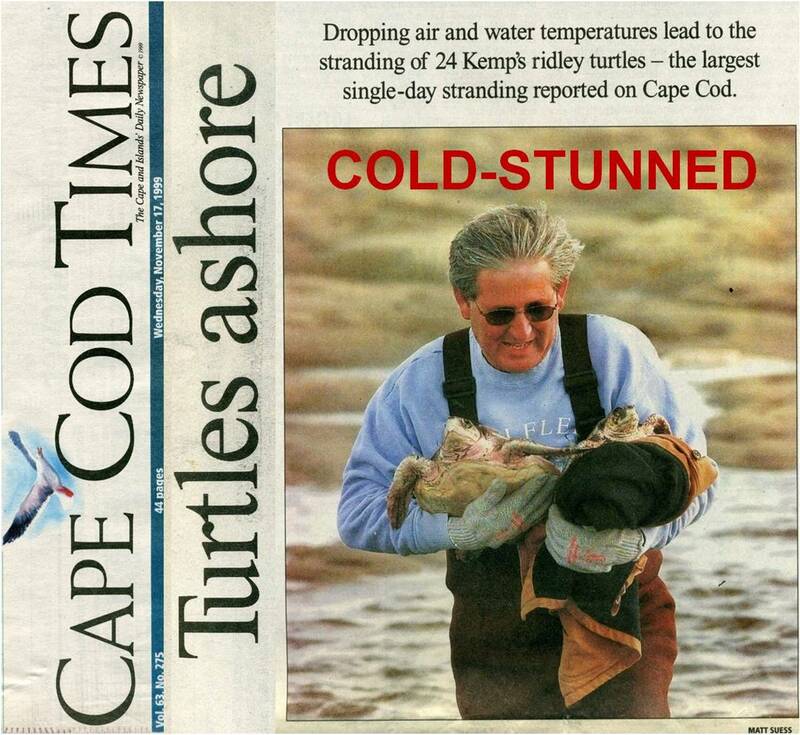 Hypothermia grips as frigid winds plunge body temperatures to freezing; death follows quickly if turtles are not recovered by intrepid rescuers. The Turtle Journal team will share their personal experiences with sea turtle rescues and talk about this global stranding hotspot. Don Lewis: Known as “The Turtle Guy,” Don’s research and rescue exploits on turtles and other threatened marine species have been featured on National Geographic TV and chronicled in national, regional and local media. Don’s work has been profiled in books on global animal rescue, endangered wildlife management, habitat preservation and natural resource conservation. 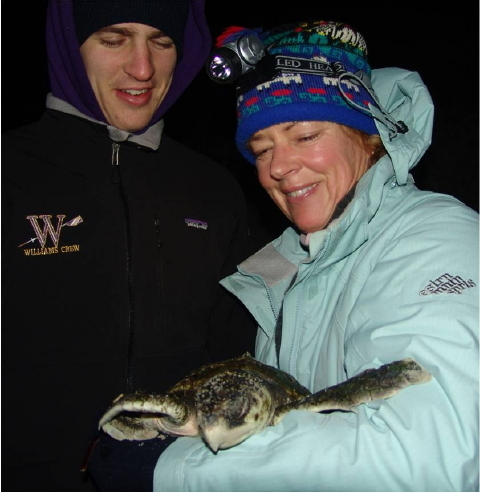 Sue Wieber Nourse, research scientist, marine biologist and master educator, is CEO of Cape Cod Consultants, an environmental solutions company specializing in wildlife management and critical habitat assessments that protect nature while expeditiously enabling client objectives. An intrepid adventurer, Sue led underwater research projects from the Canaries through the Caribbean Sea to the Hawaiian Islands, and from the Florida Keys through the Bahamas and Bermuda to Buzzards Bay, Cape Cod Bay and the Gulf of Maine. Their original nature stories and professional wildlife photography have appeared in newspapers, magazines and broadcast media locally, across the nation and around the globe. Don and Sue document the nature of coastal Massachusetts on their web site, Turtle Journal (http://www.turtlejournal.com/), and they share real-time adventures directly from the wild on Twitter (www.twitter.com/turtlejournal). 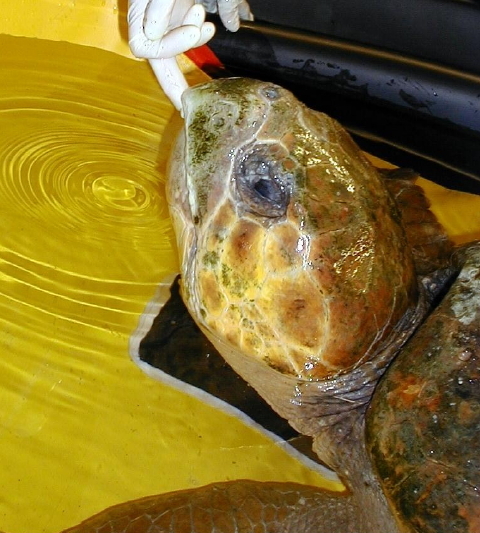 You are currently browsing the Turtle Journal blog archives for February, 2013.